As you probably realise, software is key when analysing and trading the financial markets. Indicators and tools should simplify trading decisions and allow you to gain more value from your analysis. 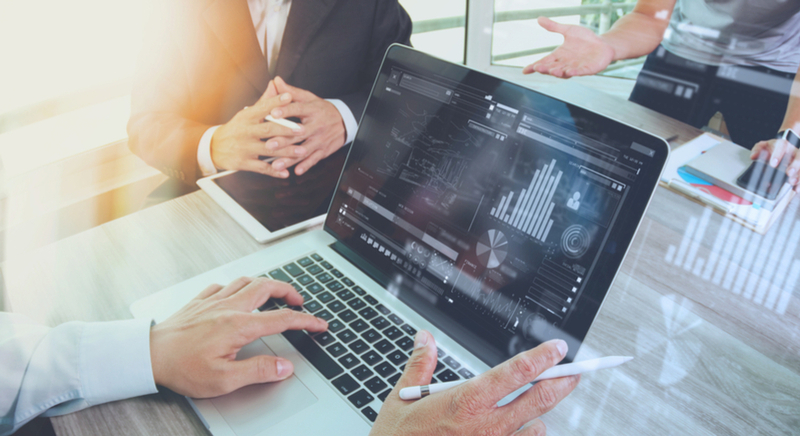 Today's article explains the benefits of using our exclusive special plug-in, the MetaTrader (MT) platform, known as Supreme Edition. This article promises to reveal how I use the plug-in to improve my analysis and trading decisions. MetaTrader Supreme Edition is a special plug-in built by Admiral Markets for the Metatrader (MT) software platform – MetaTrader 4 and MetaTrader 5. The Supreme Edition plug-in hosts 60+ extra features which the standard MT platform does not offer. The good news is that the SE plug-in is free to download for both MT4 and MT5. This means that you can first test the plug-in without any stress or worry. Global Opinion shows the sentiment of worldwide traders for financial instruments. The Mini Terminal is a handy trade management tool which allows you to open and manage trading positions. The Trade Terminal is an efficient way to manage all of your accounts and orders. The Tick Chart Trader gives you the ability to see the price move from up close and also allows for trading directly from the tick chart, exporting data, and using different chart types. 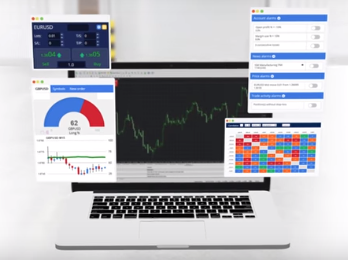 Stay connected with real-time news directly within the MetaTrader platform. The Indicator Package features a large collection of valuable indicators designed to help your trading. The Trading Simulator gives you the ability to test your strategies. The Mini Chart allows you to see multiple time frames and chart types in one chart. As you can see, the MetaTrader Supreme Edition offers many advantages and benefits for traders. How Does the Supreme Edition Benefit Your Trading? First of all, with its over 60 extra features, one statement does seem rather likely: there is a high chance that the Supreme Edition will boost your analysis and trading one way or another. The tools that provide the most benefit will, of course, vary from trader to trader. You might attach the most value to tick charts; maybe your trading buddy prefers the trading simulator; perhaps another trader will benefit the most from the Indicator Package. The best approach is to try it and discover which tools benefit you the most. For more information about the Supreme Edition, check out the video below. Admiral Markets Pivot Points, Keltner Channel, and Mini Terminal are tools that are always on my charts. You might recognise them from the charts that I've shown in previous blog articles and in live webinars with Admiral Markets. I would certainly recommend taking a closer look at these three tools because they simplify trade management (Mini Terminal) and offer a key insight to the decision zones (Pivots and Keltner). Let's review the latter in more depth! The Keltner Channel indicator is useful for all time frames as it offers support and resistance (S&R) bands around the price. Basically, the bands indicate a key decision zone both below and above the price. 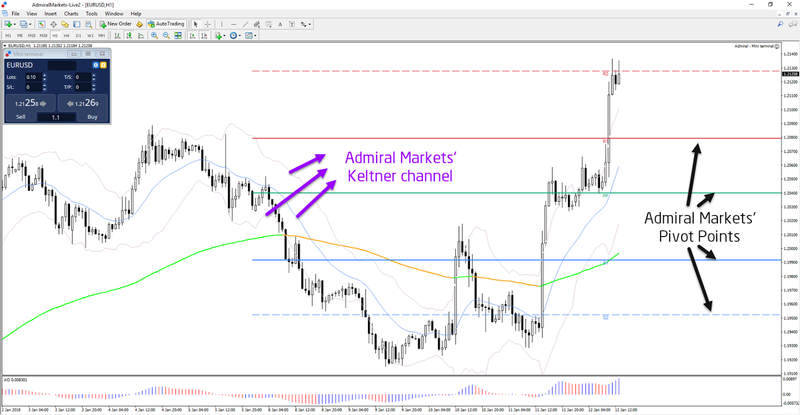 One of the benefits of the channel is that the lines are automatically calculated and plotted, which removes the need for any manual work by the trader. Weak candles failing to break the Keltner S&R indicates a better chance of a bounce. I do not use this information for stand-alone trading decisions, as I always require and seek confirmation from other tools. But it is an important piece of information when analysing the charts. The same holds true for Admiral Markets Pivot Points (PP). My personal favourite strategy is to use weekly Pivot Points on the 4-hour chart. But, of course, intraday traders will use daily Pivot Points and long-term traders might prefer monthly PP. A bounce at the S1 weekly PP could indicate a reversal back to the mid PP. Traders can use the PP to understand where the main zones are located and wait for candlestick patterns and price action to confirm bounces or breaks at those weekly PPs.